Tamburlaine has for years been one of my favourite plays-I've-never-seen, having read Christopher Marlowe's two-part epic for an undergrad paper. Approaching Michael Boyd's condensed production I was filled with trepidation; excitement to see this rarely-performed piece of brutality, disappointment that it was being directed by an old white dude (especially after Kim Sykes' incredible production of Dido, Queen of Carthage in 2017, and a season so far defined by female directors for every show in both the RST and the Swan), and uncertainty that I would enjoy it as much in performance (three and a bit hours later) as I did on the page. This production is one of the strongest I have ever seen, at the RSC or elsewhere. My reservations towards Michael Boyd were clearly misplaced, given the cast's overall excellence and (perhaps only relative) diversity, and the sheer boldness and creative fearlessness that defines the production as a whole. Heavily- and very well-edited, each part of the play lasts about an hour and a half and straddles the interval, meaty and action-packed and lacking any fat – every word, every gesture and moment of stillness or silence is necessary and brutal, from the initial capture (if that's the right word) of Zenocrate, to the various usurpations, the slaughter of the virgins, the wars, the torture of enemies, the burning of the religious books. The slaughter of the virgins was especially visceral, gasp-inducing and with an incredible use of the spectacular set and the buckets-of-blood motif. Boyd has selected such an incredible cast that it will be hard to pick favourites, and has done some incredible work with role doubling (and tripling, quadrupling...), for instance Mycetes, Soldan, Almeda and Amasia, all played to tragicomic perfection by Mark Hadfield, who unifies these significant comparable characters and, on occasion, draws attention to the convention, the theatre and the absurdity. Rosy McEwen, meanwhile, following a chilling and too-believable performance as Zenocrate, becomes Tamburlaine's nemesis Callapine for much of the second half, a shift from his constant companion to his constant thorn, and a brilliant way to get even more use out of an incredible performer. The use of multirole seemed to make an interesting comment on karma and the nature of power struggles, never so clearly than at the end of part one and the start of part two, where the dead Bajazeth, Zabina and the King of Arabia (Sagar I M Arya, Debbie Korley and Ralph Davis respectively, three of the strongest members of the very strong cast) rise, stare menacingly after Tamburlaine to the sound of tense percussion, and stalk off-stage, returning after the interval to crown themselves as their next characters, further enemies of Tamburlaine: the King of Trebizon, the King of Syria and Orcanes, respectively. Later, when this trio are captured (along with James Clyde's King of Jerusalem) by Tamburlaine, they draw his carriage and face further torture, a devastating portrayal of people animalised by individuals and regimes and a mystifyingly cruel world. 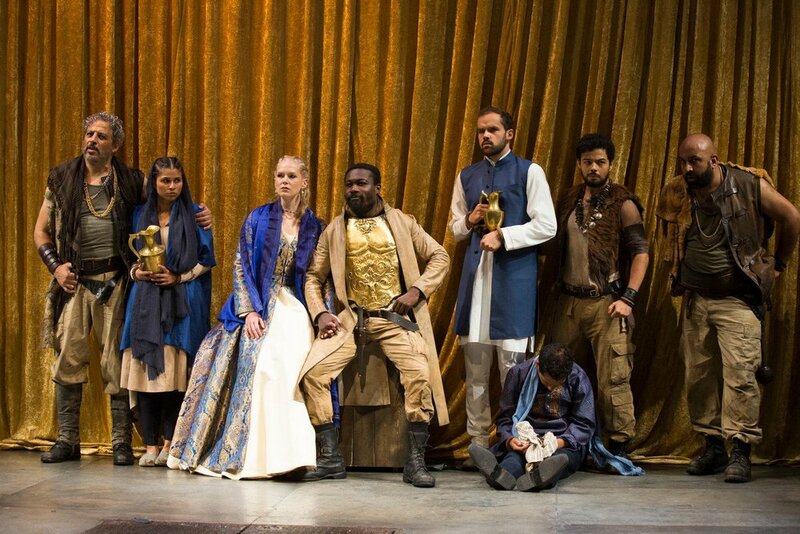 Tamburlaine's accumulation of crowns and gold, in the cage-as-carriage that had once imprisoned Bajazeth, is the perfect call-back to the gold backdrop used briefly at the play's beginning (see first photo above), a deceptive indication of Tamburlaine's wealth. This new gold then shows Tamburlaine finally embodying the powers he always laid claim to, ever the self-fulfilling prophecy. Tamburlaine himself of course carries the play, a constant focaliser, and there is no better than Jude Owusu, commanding and charismatic and a true "terror to the world", each word effortlessly communicated not just through his arresting voice but through the body, a testament to the voice and text work done by Alison Bomber. The audience are not once allowed to escape Owusu's illusion, never doubting his absolute command over the course of his meteoric rise. Even at his most atrocious we are on his side, wholly and devotedly. One of the most impressive aspects of the show is Tom Piper's design, black and metallic and imposing, sparse enough to evince many places, removed from time, open to multiplicities. James Jones' work as composer and musical director, crafting the most intense and thumping percussive score (oft accompanied by a violin), well synchronised with idiosyncratic and ominous and imposing movement from Liz Raniken. Every aspect of the show comes together for a slick bloodbath, an unforgiving meditation on absolute power and ambition, a self-made god, in a play written at a time not unlike ours, where people are kept down by powers greater than them, made to think that the rich and the powerful have a godlike hold on the hierarchies of the world. In Michael Boyd and his company's very competent hands, Marlowe's notorious play has never been such vital viewing, and may not be again for quite some time.